The Al Rawda complex ... focus on family entertainment. Al Rawda complex will feature an open internal plaza, top-class restaurants, external seating areas and water features, says ABDULAZIZ KHATTAK. 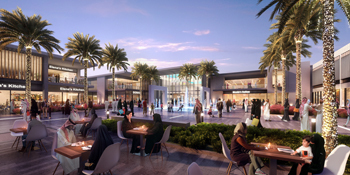 Construction work is set to begin on an upscale shopping destination in Jeddah which will focus on family entertainment. The Al Rawda complex is being developed in the Rawda district of the Saudi commercial capital as a food and beverage (F&B) and retail hub, offering an eclectic selection of high-end and new-to-market brands and commercial, residential and recreational units. These facilities will nestle in refreshing green spaces and gardens, designed to host community events and magnificent public art. With its focus being on family entertainment, the complex will feature an open internal plaza, top-class restaurants, external seating areas, and water features. Sedco Holding Group and Methak Holding Company, the owners of the project, have appointed real estate developer Sedco Development to spearhead the construction of the complex. The project’s concept design is complete and all permits have been acquired. Benoy is the architect of the project. Engineer Zuhair Hamzah, CEO of Sedco Development, says that Al Rawda has been envisioned as a signature project that will set the trend in Saudi Arabia’s architectural space. He says the developer has tried to introduce something innovative in a market. “Our vision is to become a one-stop premium destination for a family day out with the aim being not just to achieve our vision, but rather do so responsibly. We would like to become the prime location with the ultimate green footprint,” says Hamzah. The project gets its name from the Rawda district, where a number of residential neighbourhoods have been coming up over the years, but with scant premium businesses. “This is why the Al Rawda project is perfectly located. Like the neighbourhood, the mall design brings together the old and the new, where classic meets sustainable,” Hamzah adds. The project spreads across an area of 70,000 sq m and consists of a multi-purpose complex boasting a shopping mall, residential and commercial towers as well as a hotel. Under the first phase of development, a shopping mall with a leasable area of 26,000 sq m over two levels will be built. It will feature a variety of outlets as well as recreational areas and other service amenities on a total area of 50,000 sq m. This phase also includes the construction of car parking facilities for 1,000 vehicles. Commenting on Al Rawda’s architectural elements, Hamzah says the designers have attempted to create a synergy between its interior and exterior, providing visitors with a seamless experience when walking across these spaces. The outer areas of the centre have been environmentally treated to provide maximum comfort for outdoor entertainment. Internally, the design is also one of a kind with an optimum balance created between space and design. The design is captivating, bold and thought-provoking, says Hamzah. He adds Sedco has employed top professionals for the project. Project planners, economists and civil engineers all worked together in the planning stage to choose the best location for the project. The same team also worked with the architects and the construction company to plan out the design and layout of the project to suit the location and not the other way around. In terms of environmental responsibility, Sedco Development believes that this element is as essential as fiscal responsibility. Hamzah says the company has always integrated environmental goals into its projects. “We ensure all materials used in our projects are environment-friendly. Starting from the design phase all the way to construction, operation and maintenance, we ensure sustainability,” he adds. Some of the strategies employed in Sedco’s commercial buildings range from energy-saving initiatives to a holistic approach, addressing wider environmental issues such as water use, selecting sustainable materials and carefully management of waste. Efforts have also been made to ensure long-term maintenance requirements are reduced while minimising waste. Also, its buildings are fitted with top quality control systems to ensure efficiency. Other elements of its environmental sustainability strategies are minimising CO2 (carbon dioxide) emissions, material consumption and maintenance waste. In the design stage, the architects on the Al Rawda complex were asked to utilise the best quality materials. Measures have been taken to optimise on daylighting the interiors, while taking into consideration its effects on energy consumption and minimising those effects through high quality heat-reflective glass and insulation. Turning to the mechanical, electrical and plumbing systems, he says air-conditioners chosen feature variable refrigeration flow technology which provide energy savings. The duct systems promote energy conservation while the insulation plans were designed to prevent energy loss. The faucet fittings have been specified to save water considerably and are equipped with touchless technology, while the toilets are fitted with dual flush systems. “All these are part of our efforts to minimize our environmental footprint,” says Hamzah. “We look for materials made from recycled products or repurposed materials. A few examples include rubber roofing made from recycled products, composite decking made from recycled paper and wood waste paper-based countertops made from tree pulp from managed forests and carpets made from recycled plastic bottles,” he concludes.